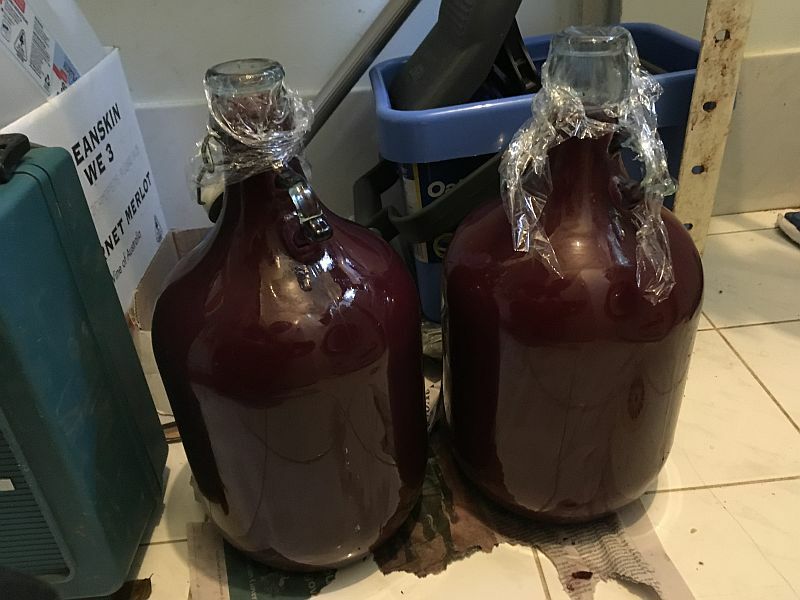 It’s been about ten days since my last post, and since then I’ve pressed the wine into two 5 L demijohns. I made the decision to press when the ferments where almost dry. I had added the EC1118 a day before I planned to press, to ensure they fermented successfully to dry. Wineries often use ‘clinitest‘ tablets to test for dryness, since refractometers don’t work well at lower sugar concentrations. These were originally designed for testing for diabetes, but helpfully are also perfect for wine. Lacking these, I used a dipstick test that may or may not also be effective for wine. iPhone SE, built-in 4 mm (~29 mm) lens, 1/17 sec, f/2.2, ISO 400. As predicted, pressing was an ‘interesting’ affair given the lack of an actual press, and one that took several hours. I initially began by attempting to press using the potato masher I’d been using to plunge the ferment, which did not really provide the level of pressure required. I ended up reverting to the age old technique of foot crushing — after cleaning my feet, I should add. In the event, it was a challenge to fill both demijohns; by the end I was pressing off maybe 20 or 30 mL at a time. Almost not worth it… The first demijohn received mostly free-run, plus some pressings, the second only pressings. I was surprised — though I shouldn’t have been — that there were a lot of intact berries remaining in the ferment. I suppose I’m used to larger ferments, where the weight of the ferment would have crushed them. As a consequence, these berries released quite a bit of sugar back into the ferments, which restarted in the demijohns. Demijohns I had not bough air-locks for, so had to seal with clingfilm(!). Again, I should not have been surprised. 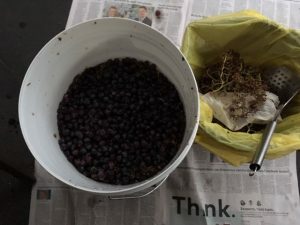 Intact berries can undergo intracellular fermentation, but this can only produce about 2.5% alcohol, at which point fermentation stops until the berry is crushed, and the yeasts can ferment the juice. 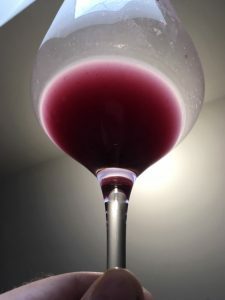 This is not dissimilar to the carbonic maceration that is tyical of Beaujolais, but without the blanketing layer of CO2 — hence, it is often called semi-carbonic maceration. It is not uncommon in whole bunch ferments. The free-run demijohn finished its primary ferment only a few days after, and I added another 25 g/L of sulfites. It is still bubbling slowly, however, so may have decided to undergo at least a partial malolactic fermentation. I have no way to test for this, however. This really is primitive winemaking! The pressings demijohn is still bubbling away, two weeks after the ferments had first been inoculated. I’m used to inoculated wine ferments only taking 7 – 10 days, so I am somewhat surprised by how slowly it is progressing. I’m also beginning to wonder whether it is also undergoing a malolactic fermentation, which can occur concurrently with the primary, alcoholic, fermentation. 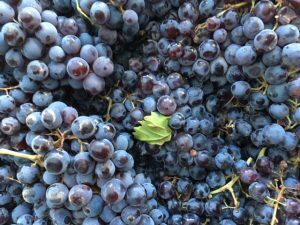 Luckily, the grapes had plenty of fresh, lively acidity, so a malolactic fermentation would only help the wines. It’s a bit hard to sample from the demijohns, so I don’t know how the wines are tasting. Hopefully, I will get to try them in April. As with any wine making, it is a matter of patience. iPhone SE, built-in 4 mm (~29 mm) lens, 1/17 sec, f/2.2, ISO 500. 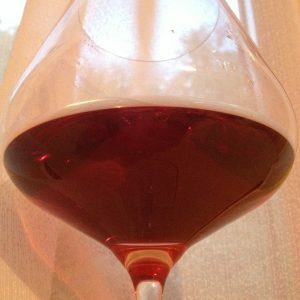 I have been wanting to try my hand at making my own wine for some time. I have, of course, helped others make wine numerous times, first during my oenology course at the University of Adelaide, and as a cellar hand. But I was always following someone else’s instructions, and had little input myself. Perhaps it’s an ego thing, but I wanted to try making a wine myself. After ‘phoning to confirm, I got up at 5:30 am to be at the market by 8 am on Sunday. I bought a crate with 20 kg of Riverina grenache for AU$30. There wasn’t a choice, it was a matter of what was available at the time. The quality seemed decent — a bit of rot, but nothing too serious. I don’t have a refractometer, but the fruit tasted very sweet, and the juice was rich and delicious. Being grenache, it was safe to assume it probably at least 13,5° Baumé, which works out as approximately 14% potential alcohol. iPhone SE, built-in 4 mm (~29 mm) lens, 1/20 sec, f/2.2, ISO 200. The first problem was to de-stem the grapes. Not having a de-stemmer (this was being done on the cheap! ), I hand de-stemmed the grapes into a food grade 20 L plastic bucket, throwing in maybe a dozen or so whole bunches. The idea was that the stems would add some tannins and some structure, something which grenache can sometimes lack. iPhone SE, built-in 4 mm (~29 mm) lens, 1/33 sec, f/2.2, ISO 25. Finally, I crushed the grapes as best as I could, and inoculated with R56 yeast (with EC1118 on standby, in case the alcohol levels are too high for this particular yeast). A potato masher served to plunge the ferment. After a few days, the colour looked good, and the wine was starting to taste pleasantly of strawberries. So far, it had not gone volatile or oxidised (a problem with grenache in particular, and with small ferments in general). But, of course, that can always change. Pentax K-x, 18-125mm lens @ 18mm, 1/320 sec, f/8.0, ISO 400. Panorama created using Lightroom. Late summer, at the tipping point of autumn. Harvest ahead. Cycling back to Meursault in the early evening. Rain hanging around, spitting, threatening. Grey clouds glowering overhead. As the sun disappears, the clouds relent & turn golden with the dusk; bluegrey & gold, like slate and fire, iron and gold. However the day seemed prior to this, it is a benediction; it is like the threat inherent in those splattered rain drops has passed and been forgotten. But I was heading back to Meursault. Still in Beaune, not yet in Pommard, & needing to be back before the light faded for the evening. But I couldn’t move on: the light changed from gold to galah pink, the clouds still glowering slate grey above the vineyards. Pentax K-x, 10-24mm lens @ 10mm, 1/60 sec, f/8.0, ISO 400. Panorama created using Lightroom. Eventually, I got back to Meursault. Late, I struggled to find a restaurant open. Luckily, the Hôtel du Centre was still open, just. The dinning room was starting to empty. A couple, a businessman polishing off the last of a bottle of wine. I had magret du canard and a glass of red burgundy. My luck was still with me: the duck was beautiful, rich, flavoursome, seared outside and bloodily red inside. The sole mishap, that I was given a glass of Côtes-du-Rhône instead of the requested Santenay, was no mishap in that it was an excuse for two glasses of wine rather than one. What had been a desperate attempt to get something, anything, to eat, was anything but. What was to be a simple meal, an unexpected pleasure. Serendipity! The meal finished with a glass of an armagnac older than me, and a petit café. Walking back afterwards, the sky was perfectly dark. Sodium lights lit the village, and the edges of vineyards. I walked past a clos, and looked in through wroughtiron gates at the vines, sleeping before the harvest, unworldly under the orange light. Gold to pink to orange. iPhone 4s, builtin 4.28mm (~35mm) lens, 1 sec, f/2.4, ISO 800. Shot using Camera+ 9.1. 2010 was the first year I visited Burgundy. By coincidence, it was a catastrophically good year across the region — more classical and less rich than 2009, but refined and built for ageing. 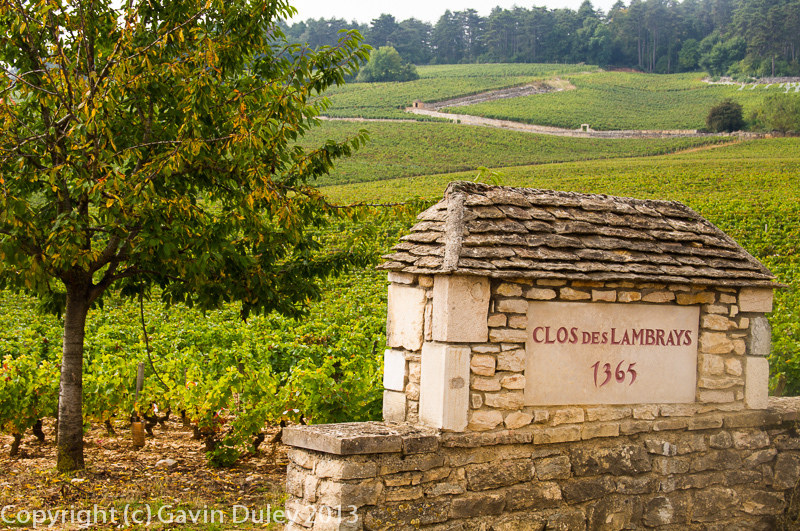 I barely knew a grand cru from a premier cru — and, with Burgundy, there is such a lot to learn. 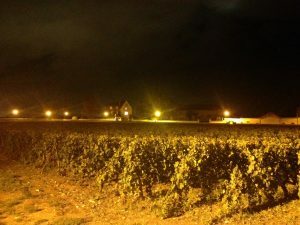 I visited Pommard, Volnay, and Meursault for the first time, and took a bus north to see a glimpse of the Côte de Nuits. I walked around Beaune. I tried Burgundian cuisine for the first time. I visited the Hotel de Dieu. Burgundy is such a remarkable place. I was there during the harvest, and would have seen the grapes being picked. I didn’t actually get to work a harvest till 2011, the way things worked out, but it was a good introduction. Now, seven years on, a lot has changed. Visiting Burgundy again, too briefly, I feel lucky to be able to sample a 2010 from Volnay. Volnay was a village I didn’t immediately ‘get’. Initially, I far preferred the wines of Pommard, which are richer and more full bodied. Volnay, elegant, light, ethereal, escaped me. Over the years, I’ve drifted from preferring Pommard to preferring Volnay. Seven years. A lot has changed. This particular Volnay — Bernard Delagrange’s 2010 Volnay 1er cru, presumably a blend of premier cru vineyards, is a perfect example. At seven year’s of age, it still seems very young. It’s fresh, and lively, and full of primary fruit. It hasn’t yet developed any aged characters. It has plenty of cherry, with a touch of pomegranate and perhaps cassis, with lots of sweet spice, and is elegant and light. I love the way the light refracts through it — still supple cherry red, translucent. Elegant. It’ll keep a good few years more. It’s a vintage — and a region — I hope to keep returning to. Nose: cherry, pomegranate, cassis. Dark chocolate. Sweet spice. Old oak, vanilla. Palate: still seems v.young. Lots of red fruit — cherry, raspberry, pomegranate. Perhaps a touch of cassis. Sweet spice. Fine grained, slightly drying tannins. Moderate, berry-like acidity. Smooth, subtle/supple and medium bodied, elegant. Not the most complex Volnay, but very pleasant and typical of the village nonetheless. Very nice. 13% alcohol. I have a private pet theory for determining the best regions for growing Pinot Noir wines that I unaccountably want to share. It’s this: all the best regions have ’03’ phone area codes. This might seem crazily over-simplistic, but bear with me for a moment. I have proof. The Adelaide Hills region gets 08 numbers assigned to it. Oregon and California both are part of the North American Numbering plan, which does not assign any numbers starting with a zero. Some parts of north-west Oregon get 503 numbers, which may be close enough — though this doesn’t seem to cover the Willamette Valley. D’oh. Germany is making some very good Pinot Noirs (which they often refer to as Spätburgunder, “late Burgundy”), but 03 numbers are assigned to north-eastern Germany, not Baden, Pfalz, or Ahr, which are in the south-west. Martinborough, NZ gets 06 phone numbers. Also, some areas may be assigned 03 numbers, but not be suitable for Pinot Noir — for example, some of the warmer parts of Victoria, Australia. To this, I could only respond by waggling my eyebrows, shrugging my shoulders, and leaving rapidly before my hypothetical interlocutor realises that wasn’t actually a valid response to their criticisms. Nonetheless, I think my theory has validity, and maybe some predictive power. Perhaps I could extend it further. Do good Cabernet sauvignons come from regions with 05 numbers, such as Bordeaux? Great Syrahs from regions with 04 numbers, like the northern Rhône? Though this might be a problem for Australia: 04 and 05 are both assigned for mobile numbers, which suggests that great Cabernet and great Syrah are possible everywhere, and nowhere (though, to be fair, I’ve never actually seen an 05 mobile number in use in Australia…). Italy has a similar problem with Pinot Noir (there called Pinot Nero), 03 numbers in Italy being assigned to mobile phones. Or perhaps one could suggest that areas with an 08 number are good for a wide range of grapes, as this area code including both South Australia and West Australia. But this would force wineries in France to spring for a freephone ‘numéro vert’ 08 number, which may not win me friends there. So, for now, I might leave further exploration of this idea aside for now. Still, I suspect it has promise. And I will keep returning to the allure of the ’03’ area code. Which reminds me, I should open a bottle of something good for tonight, from a winery whose phone number starts with 03………..
Pentax K-x, 18-125 mm lens @ 73 mm, 1/125 sec, f/8.0, ISO 200. Some places you can’t forget. They bury themselves deep within you, and refuse to leave. Everything else is seen in relation to them – for better, or worse. I grew up in London, and the brilliant blue of a clear winter’s day, or the oppressively leaden sky of a dismal summer day, is always with me. One such place, for me, has been Burgundy. For one reason or another, I have always visited in late August or early September. Arriving by train, from London via Paris, you first notice how Burgundy still clings to summer, even as London sidles towards the grey drizzle of winter. Changing trains in Dijon, the local train to Beaune – historically, the wine producing capital of the region, where the major wineries had their bases – local stations and vineyards flash by, as well as woodland and cornfields. Once in Beaune, it’s hard to know what to do. Most of the famous wineries require appointments, or are outside Beaune itself, in the smaller villages, in the cellars of medieval houses, or in concrete warehouses on the edge of the vineyards. Still, as Mike Steinberger said, “there may be different paths to wine geekdom, but they ultimately all converge in the same place—Place Carnot” – so you may as well head straight there. Place Carnot is, more or less, the main square of Beaune: its heart, and its centre. If nothing else, there are bistros and restaurants, and beautiful cakes at Dix Carnot. This little square surrounds a small park; the tall buildings seem quintessentially French. Just a street off to one side is the Hospice de Beaune, often also called the Hôtel Dieu, with its elaborately decorated roofs made from coloured tiles. Once I’m sat outside Dix Carnot with some improbably elaborate cake, I know I’ve arrived. I can plan: what wineries to visit? Hire a car? A bike? (Yes, many of the villages south of Beaune are within comfortable cycling distance; to branch out further afield and see forests and monasteries, or even just the villages north of Beaune, a car is essential). 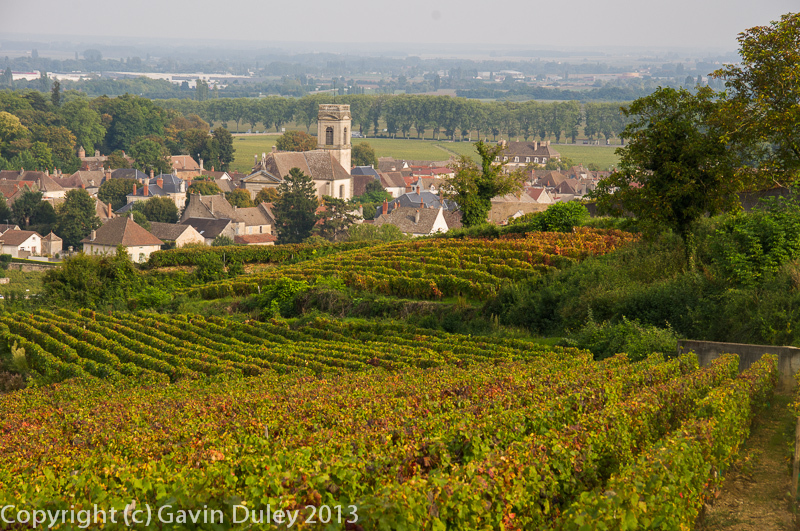 Frankly, Burgundy is a maze, and it will take you time to get your bearings. Take the time. Visit again. You will. I feel I am, slowly. For whatever reason, I have only visited in late summer or early autumn. I would love to see the Côte d’Or blanketed under drifts of snow, or with the first buds of spring just breaking. It is a tapestry of ancient villages and tiny vineyards, each with its own subtly different aspect on the hillside, its own soil, its own climate. Vineyards just next to each other can produce profoundly different wines. The whole region itself teeters on the edge of several climatic zones: it is part continental, part oceanic, with warm weather sometimes coming up from Provence in the south, and cold from Germany or Switzerland in the north. Even the buildings, and the towns, can start to look Provençal at times, at others, they seem northern. Burgundy is a paradox, but a delightfully vinous one. Cycling south out of Beaune, there are small roads that wind through the vineyards towards the village of Pommard. These roads are shared only with vineyard traffic, they are ideal for cycling. You cycle past stone-wall circled vineyards, the roadside edged with wildflowers. The track meanders on towards Volnay, then Meursault, and onwards towards Chassagne-Montrachet. I have never made it further south than Meursault, so far. If you know something about French wines, these are names to conjure with. Pommard is known for robust, tannic Pinot Noir, its neighbour Volnay conversely for ethereal, light, perfumed Pinot. Meursault is known for its Chardonnay. Even without an appointment there are small wineries with cellar doors you can visit. Most will have wines from a range of villages, and it is instructive to taste a couple. 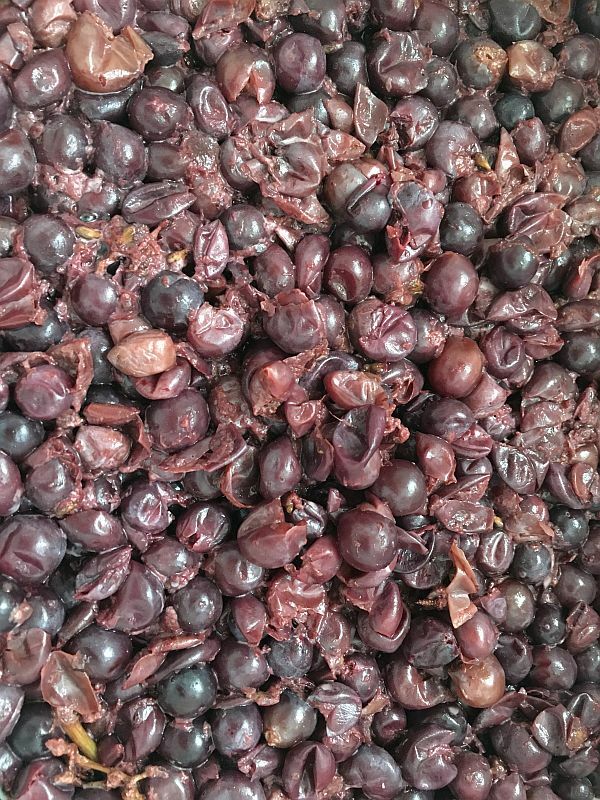 Even where winemaking techniques are the same, the flavours and aromas differ dramatically between villages. 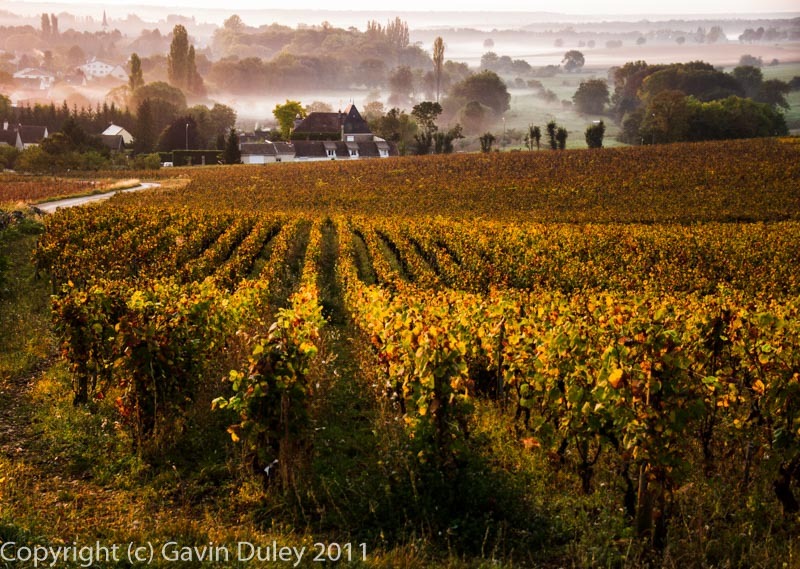 A place like Burgundy leaves you with many impressions, as you encounter different faces at different times. 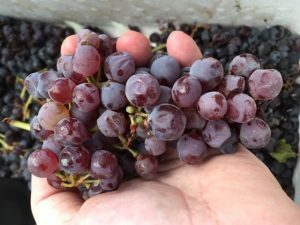 Looking back through my notes, I encounter everything from pages and pages of detail on viticultural techniques, to gripes about the weather, plans that have gone wrong, or meals that were more than memorable. Like, being forced into a small restaurant on the edge of Pommard for an unplanned lunch by unexpected rain: an inconvenience at the time, particularly since I was counting my pennies, but the sort of thing I would normally dream of. Or a meal at a small restaurant just outside the city centre of Beaune, with a shared, long table, where I ended up in deep discussion with several other diners, and did not stumble out the door until eleven pm. There were people from Japan, from Brazil, from Switzerland, from Holland, from America – and me, from Australia, via Britain. The Brazilians thought that the Europeans worked too hard, and didn’t live enough – something the Europeans objected to. The conversation spilled out onto the street outside, and, in my head at least, followed me home. What does it say when you meet people you feel you’ve known all your life, but know you won’t meet them again? Such is travel, I guess. The next morning, Beaune was as quiet as ever. That morning, I drove to Château-Chalon, leaving Burgundy behind for the foothills of the Alps. But, as always, I knew I’d be back. Pentax K-x, 18-125 mm lens @ 40 mm, 1/100 sec, f/8.0, ISO 100. This is a longer form of an essay I wrote for a travel writing competition (which I didn’t win! ), organised by travel insurance company World Nomads. The version submitted can be seen here. Apple iPhone 4s, builtin 4.28mm (~35mm) lens, 1/60 sec, f/2.4, ISO 50. In vino veritas … but is there? I suspect the saying simply refers to wine’s infamous ability to loosen tongues, and that is not what interests us here. Wine, however, has its own truth, which is unrelated to the unguarded confidences of inebriates, that is perhaps universal and eternal precisely because it is so local and specific. You might be seeing the idea that I’m dancing around here. Great wine reflects where and when the grapes were grown as much, if not more, than what happened to it once they got to the winery. They reflect the weather of the growing season, and the climate, soil, and aspect of their vineyard — or vineyards. (Must the impact of terroir be more dilute in wines made with grapes from a number of different vineyards within the same region? Or, even, from different regions?). 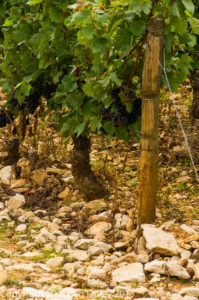 As Henri Jayer said, “Vines each have typical aromas, small red and black berries and cherry for pinot, which can be found regardless of the region of production, but terroirs develop the potential of that extraordinary and still mysterious vine” (Rigaux 2009, p. 148). That winemaking will have an impact is inevitable — grapes do not turn into good wine by themselves. Different techniques in the winery, and choice of oak barrels (or no oak barrels) will all have their impacts. But, hopefully, not enough to drown out the rather quiet voice of the terroir. 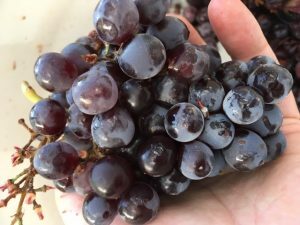 Good winemaking may be about growing (or purchasing) good grapes and not messing them up in the winery, but there’s more to ‘not messing up’ than such a simple sentence implies! All of this is a roundabout way to saying that great wine will reflect where it is grown, and this may lead to wines which are truthful to their site, but idiosyncratic. The wine pictured is a Shiraz-Cabernet blend from Langhorne Creek in South Australia. 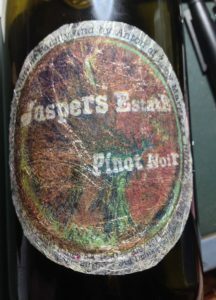 It is a big wine — full of the “muddy soulfulness of the Creek”, and the “eucalypt-and-mudcake” character that Philip White described as typical of the wine (White 2013); deep and opaque in colour, and 15% alcohol — and thus, perhaps, seems as far away from, say, a Jura Poulsard as one could get whilst still being a red wine. Yet, if each reflects where it was grown with some honesty, they could both be said to be true wines, great wines. They reflect the radically different sites in which they were grown. As Henri Jayer said, “From all this we should learn that typicity exists, that it shows itself in extraordinarily diverse ways, and we must respect that” (Rigaux 2009, p. 49). None of this is to erase the individual preferences of whoever ends up drinking the stuff, of course. 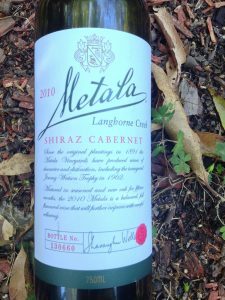 It’s possible someone more accustomed to Bordeaux, Burgundy and the Loire may not enjoy such a massive, full-bodied wine as the Metala. Or that someone who likes such wines may not like lighter reds. (Personally, I like both…). But is it possible to say that, whilst you don’t like the wine style, it is a true reflection of its terroir? And can a wine which is not from a great site be a true wine but not a great wine? As Jayer said, “When we taste a wine, we taste to see whether it has good typicity, and if it illustrates the general characteristics of its terroir ” (Rigaux 2009, p. 46). Apple iPhone 4s, builtin 4.28mm (~35mm) lens, 1/20 sec, f/2.4, ISO 80. Rigaux, J 2009, A Tribute to the Great Wines of Burgundy: Henri Jayer, Winemaker from Vosne-Romanée, trans. JK Finkel, Terre en Vues, Le Chatelet, France. White, P 2013, Jimmy Watson Tropy Goes To a Wine, viewed 4/12/2016, <http://drinkster.blogspot.com/2013/01/jimmy-watson-trophy-goes-to-wine.html>.